What Stage of the Bull Market Are We In? Fortunately, one of the most valuable lessons of my career came in the early 1970s, when I learned about the three stages of a bull market: the first, when a few forward-looking people begin to believe things will get better, the second when most investors realize improvement is actually underway, and the third, when everyone’s sure things will get better forever. You should notice that both of these definitions are completely subjective. They don’t say that bull markets are done once we hit defined valuation targets. Nor do they say that once a market sentiment survey reaches a certain level that a bull market will end. The most intelligent investors are the ones that are willing to admit that there is no certainty with market cycles. The pundits, portfolio managers and financial advisors with the most certainty are usually the ones you should listen to the least. It’s impossible to know exactly when a market cycle will end because the pendulum can swing too far in either direction. For every data point on stock ownership or investor sentiment that shows stocks are overvalued someone can find the counterargument that shows the market is actually fairly valued and vice versa. Anytime you see a data set trying to define the entire stock market you can take it with a huge grain of salt. This is because markets are emotionally-driven. There are so many moving parts involved that it’s impossible to simply use a single variable or even a handful of variables to tell you exactly when the good times will end. We’ve been inundated with crash calls for the past 3-4 years. Much of this is because of the recency bias since we’ve witnessed two huge market crashes in the past decade and a half alone. Some are fear-mongering and ill-conceived but many have come across as intelligent arguments about why the bull market should have ended. It hasn’t mattered just yet. Investors probably spend too much time trying to determine which year the current market set-up resembles. Is this 1999 all over again? Is it just like 2007? How about 1987? The fact is that investor actions are shaped by past experiences so 2014 is just like 2014. The only constant is that investor emotions shape market dynamics, especially over shorter time frames. This is why Templeton and Marks used market psychology to describe bull markets and not CAPE ratios or free cash flow multiples. These things are impossible to call with any precision. The best you can do is use the process of elimination to see where we aren’t. We’re well past pessimism and skepticism (save for those that have been wrong the entire way up). Everyone realizes the improvement is underway. There’s no blood in the streets. There are no babies being thrown out with the bathwater. It’s not time to get greedy. Does that mean it’s time to sell all of your stocks because we’ve seen huge gains over the past five years? 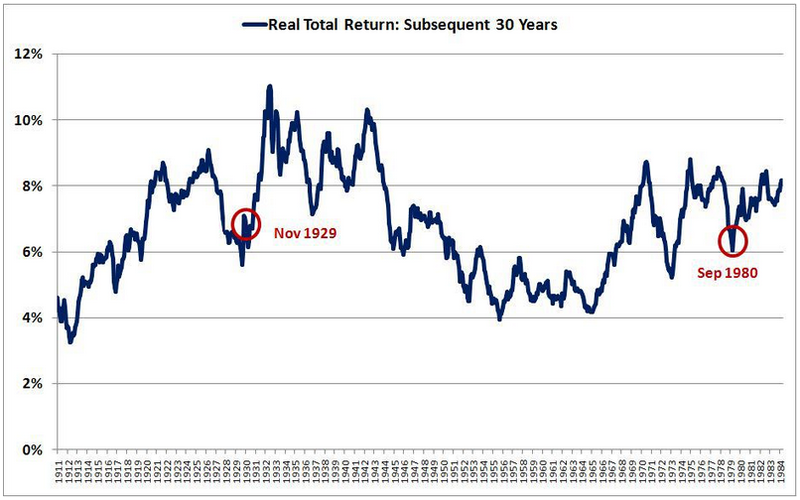 Surprisingly, a long-term investor that bought the market in November 1929, immediately after the first drop, did better than a long-term investor that bought the market in September 1980. Patience can be a great equalizer of cycles in the financial markets. As Barry Ritholtz reminded his readers in the Washington Post this weekend – time, not timing is key to investment success. The bull market will end at some point. Stocks will go down and we will eventually see a bear market. These things happen. When it happens is up to Mr. Market. I think we are just at the end of skepticism with all the negatives about this market getting a lot of ink and opinions for quite a while. It feels like the optimism has only recently begun. The great thing about the markets is that you could ask 10 people and get 10 completely different answers on what they think the current sentiment is.